The Quinta de Ervamoira 10 year old tawny cooler packs by Casa Ramos Pinto have received the 2015 Red Dot award for communication design. The Red Dot Design Award is the most prestigious international design and communication competition created by Design Zentrum Nordrhein Westfalen based in Essen, Germany. The 2015 Red Dot Design Awards had over 7000 candidates from 53 countries. 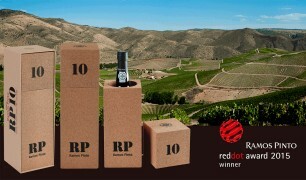 The attribution of this award to this innovative packaging, designed exclusively for Quinta de Ervamoira 10 year old tawny, is the result of a strategy of investment in the development of environmentally-friendly packaging solutions made from natural and noble materials such as cork with state of the art design standards, which essentially offers consumers something both useful and relevant. The packaging provides information and advice on drinking the wine at the right temperature and serves as a carrier bag but can also be reused in an innovative and creative manner.